We are a full service warehouse distributor of in-process, transfer and control equipment. Featuring product lines in LP-Gas/NH3, Industrial Equipment, Industrial Gas, NOX/SCR, NGL and Integrated Systems. Gas Equipment Company, Inc. (GEC) is an integrated warehouse distributor of in-process, transfer and control equipment for oil and gas producers, transporters, and LP-Gas marketers. GEC has been continuously owned and managed by the LaDue family since Milt LaDue founded the company in Dallas, Texas in 1937. GEC marked a milestone in 2017 celebrating our 80th anniversary in business serving the LP-Gas industry, providing premier product lines with factory trained and experienced staff throughout ten warehouse sales branches strategically located in a large geographic distribution network across the central, southern and eastern U.S. Our service commitment is to provide same day service and next day delivery. Our service strategy also employs designing our product availability around specific solutions supported with an extensive investment in inventory. Our current president, since 1998, is Skeeter LaDue, grandson of the founder. Under the Gas Equipment umbrella is Rochester Gauges, Inc., Rochester Gauges Mexico, Rochester Gauges Belgium, Rochester Gauges Shanghai, and Kroch Engineering in Belgium. Rochester is the largest domestic manufacturer of float gauges in the United States. Their main manufacturing facility is located at our company headquarters in Dallas, Texas. Gas Equipment Company focuses on being a market sensitive supplier by profitably managing our assets to make products and services readily available for our customers’ distribution locations. We strive to be the top-of-mind source for all your equipment needs. Our greatest asset is our employees. Sale s representatives and customer service equipment specialists are factory trained and experienced in all product lines to provide dependable solutions with a personalized approach to a customer base that spans twenty-eight states. Armed with extensive product knowledge, our fifteen sales representatives daily travel assigned territories conducting field and classroom training seminars, providing safety information, establishing a direct link to manufacturers and they are committed to industry and association service. 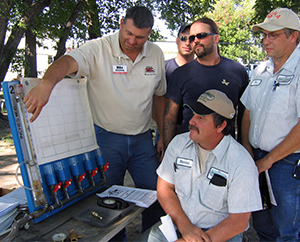 Our representatives offer in-field hands-on training demonstrating proper pump & compressor rebuilding for Blackmer & Corken products, and meter rebuilding for Liquid Controls and Neptune products. All training consists of a designated curriculum, testing and certification of your employees. We will also offer CETP training for personnel in various locations. We have the ability to develop custom special training for customers upon request. Our people provide value-added services such as: unique distribution system line sizing (engineering with application software) for systems in excess of traditional chart capabilities, design engineering for pump and/or compressor systems with manufacturer application software, cylinder cabinet fabrication/distribution, cylinder & Autogas dispenser cabinet custom design and fabrication, custom product development, bobtail truck upgrade & troubleshooting consisting of meters, pumps, distribution systems, valves, reels, and field observed and designed product solutions. Supporting our customer service and sales representatives we have three Product Manager Specialists with expertise in Meter Electronics, Pumps & Compressors, and Remote Tank Monitoring with actual in-field hands on experience. 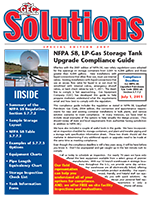 In 2007 GEC published a comprehensive 2011 Bulk Storage Upgrade Compliance Guide. All of our sales representatives are available to conduct bulk storage inspections and reviews to provide engineering design recommendations with digital photographs, drawings, and parts lists for bulk storage transfer systems including tanks, bulkheads, pumps, compressors, piping & valves. We distribute equipment from premier manufacturers with the most extensive product lines in their respective industries. Our product offerings cover the multiple phases of product transfer from terminal loading to transportation, storage and delivery, dispensing and all the way to the ultimate consumer. Gas Equipment Company is a master distributor for the following key lines: RegO valves and regulators; Rochester Gauges; Blackmer pumps & compressors; Corken pumps & compressors; and Liquid Controls meters and meter electronics; Road Runner diesel displacement; Clean Fueling Technologies. Our investment in a comprehensive information technology system provides EDI electronic ordering, electronic order tracking, delivery confirmation, customized reporting capabilities, support and website management of remote tank level monitoring products, and website catalog along with online ordering through our virtual warehouse and business to business web capability. Gas Equipment Company is a member of all state LPG associations in our market areas and encourages active participation by our employees on committees and boards. We are a member of the National Propane Gas Association and actively participate on various committees. 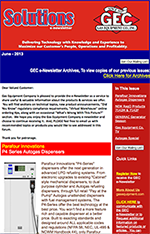 We publish monthly, an electronic newsletter and periodically, “Solutions”, an industry informational periodical showcasing new products, product updates, and useful application information including technical bulletins of various product offerings. And we have custom developed and distributed an exclusive informative series of posters on designed equipment applications and parts information for reference at customer field locations. Many of these tie directly to the training curricula we provide on-site, at your local field offices. We view our relationship with customers as a partnership. In a partnership both parties work together toward shared goals. We have worked together toward shared goals successfully in the past. And we will do everything we can in the future to exceed your expectations and build upon our partnership. We appreciate your business and will continue to work hard to earn it.